Why Book Packaging is Necessary and What Materials Can Be Used? Since the technology has led us to buy goods off the internet, book shopping has taken its place in the online shopping world. With a growing industry of billion dollars, people tend to buy their books while sitting at home which gives the book sellers an immense shot at finding right customers and double their profits. Nevertheless many online book retailers fail to find that success and end up wondering what went wrong. We’ll tell you about the things that you don’t give much attention and cause a serious drop in your earnings. Yes it depends on how you pack the book before shipping it. It’s a tiny detail that fail to get attention of many online book sellers. This article from Amazon Discussions Feedback forum will give you a clear insight of people getting damaged books packed in book mailers. 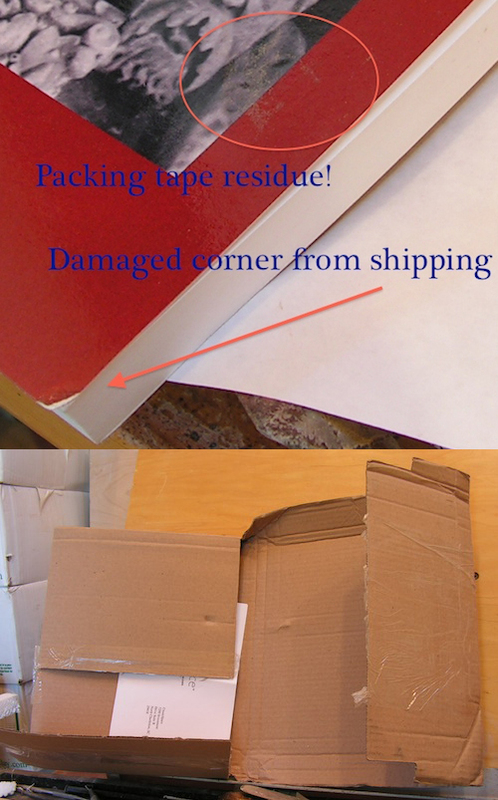 Poorly packed books will have damaged corners or worse which will lead to loose a potential repeated customer or even getting a bad review resulting in tarnishing your reputation. The above image posted on createspace forum by a user is an example of a damaged and poorly packed book. Now you must have a clear idea why your are getting unhappy clients and loosing profits. Therefore a good packaging box for the book you are shipping is a necessity. Accept it, if a customer is buying a $100 book from you, he deserves a good packaging. So if you are thinking to get book packaging boxes or mailers, be sure to get our custom printed cardboard book packaging boxes. Do You Really Have To Get A Custom Packaging Box For The Books you are shipping? You might have realised the importance of book packaging boxes but still wondering why it has to be a custom book packaging box. Let us shed some light into this. A custom box will be manufactured keeping in mind the size of a specific book so it doesn’t have empty space inside the container and book will stay still while being tossed during the shipping process. And a custom printed packaging box will contribute to promote your brand or will have certain instruction about the packaging. Therefore you should choose a custom book packaging box over a general box or mailer and we do offer a rate that is guaranteed to be unbeatable. Home » Blog » Why Book Packaging is Necessary and What Materials Can Be Used?